"Complex of Etretat" for Mortimore (2010). Here, we indicate them by "hhillocks and basins", terms which do not foresee either the genetic origin, or the too precise shape, or the geographical location. 1) The undulations represent structures of accretion. It is the hillock which plays the leading part. It is a shape of differential growth with regard to the neighboring funds. The bodies (Bryozoaires, Seaweeds, Toweling) are implied in the trapping of the sediment. The hillock is then similar to biohermes or to mud-mounds, with an accretion "iin the wind" " under the influence of currents of outline (Esmerode and Surlyk, on 2009)). 2) The undulations represent structures of ablation (QQuine and Bosence, on 1991; Mortimore, on 2010)). It is the basin which plays the leading part. It is then necessary to see in this shape in hollow a channel dug in pre-existent deposits. The currents (currents of outline, currents of littoral drift, currents of tide) play a role of erosion and travel of the chalky particles. The basin is in this case a longitudinal structure (axis parallel to the currents). 3) The undulations are mixed structures of that we accretion and ablation. They are an essentially mechanical answer of the bottom to the continuous action of currents (ccurrents of outline, currents of upwelling). 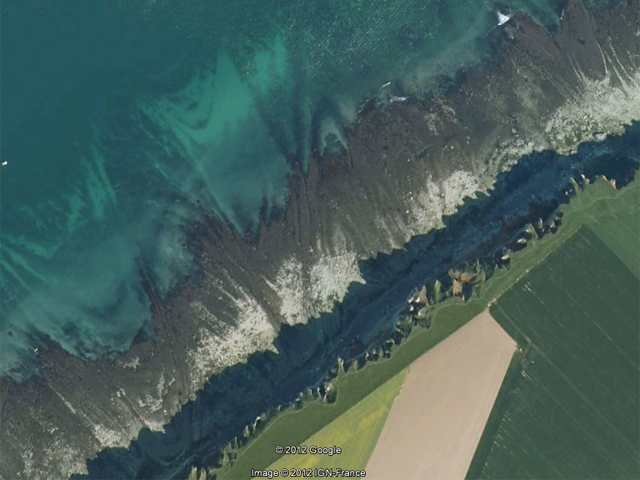 Hillocks and basins are then similar to dunes and hydraulic megawrinkles, as he can exist in the estuary of the Saint Lawrence there (Curling ribbon and Duchesne, on 2009) or in current oriental Manche (Héquette and Rufin-Soler, on 2007)). In this case, these structures are transverse (pperpendicular axis in the currents)). This last hypothesis is the one favor in a large number of case. She stands out from observations of their geometry in 3D on the platier made on aerial photos or since the top of the cliff (hillocks and basins of lower and more average Coniacien). The platier of Bénouville is one of better examples. The forms it hollow do not seem to it linear or méandriformes as would be it channels. Hillocks and basins are structures in 3D, lengthened but elliptic with an axial ending. In every hypothesis, the fixedness of these structures during the times (they are generally affected only by a simple drift) is surprising. The "life" "expectancy" of the shape is of the order of 100 000 in a million years. Stabilizing mechanisms (biological fixation for example) could contribute to their holding. The surface Octeville and Saint-Jouin (Juignet) of lower Cénomanien is clearly érosives. Turonien upper to the SW of Etretat is traveled of spectacular undulations. Lower Coniacien, between Etretat and Fécamp, is very rich in it hard-grounds mutually obliques. The end of Coniacien is cut by the HG Veulettes which conditions the later filling. Upper Santonien is also cut by Barrois ' Sponge Bed. Only Campanien, little represented in Haute-Normandie, seems exempt from sedimentary undulations. Certain stratigraphical intervals see developing a stratification in hillocks and basins. They alternate with intervals with flat stratification. 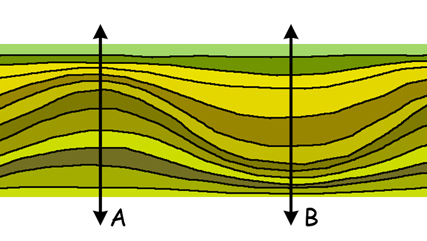 In the simple case where the undulations are in phase, we notice that the rate of sedimentation is variable according to the position on a hillock (A) or on a basin (B). On the hillock, the sedimentation is stronger initially and is reduced when the hillock is built. Conversely, it is late that the sedimentation increases in the basin. A first obvious consequence is that the stratigraphical levels older are better expressed or better kept in the base of a hillock, while the most recent stratigraphical levels will be it at the top of a basin. The search for a synthetic stratigraphical cup will take into account the information where the sedimentation is optimal. A second consequence concerns the different lithologie chalks at the level of a hillock or at the level of a basin. The works of Quine and Bosence (1991) detailed microfacies met in the various positions. The high points are most sensitive to the currents and hard-grounds develops there preferentially. The third consequence is the existence of slopes on the sea bed sometimes superior to 30 degrees. It represents a potential instability in the chalky sediment which possesses an angle of low cutting. Mechanical requests (earthquake, strong swell) can activate submarine slidings being translated in cliff by levels of slumping (coats by-passed in basal planing, weaknesses listriques in spoon ..). The only forms which we bring back hypothetically to mud-mounds are the mounds which develop on the almost flat surface of Chalk Rock between the valleuse of Antiiron and the Door of Approval to Etretat. They develop in chalks with big flint and have an almost symmetric growth. These structures are the first ones chronologically on local Chalk Rock and do not offer activity érosive. Attention, the hardgrounds of lower Coniacien can also reach Chalk Rock, but they take place after mounds with flint attributed to upper Turonien. A relation with the tectonics? A hypothesis on the remarkable development of hillocks and basins in the Block of Callus is moved forward by Mortimore (2010). Runner of the fact that these geometries appear to the base of upper Turonien (over marls Glynde), he binds their development to the surrection of low amplitude of an anticlinal of growth and to the training on the submarine back of channels (channels of tide appearing because of the reduction of the slice of water, maybe, but this relation is not discussed). This hypothesis is supported by an offshore seismic profile (Quine and Bosence, on 1991). This explanation seems to us however open to criticism because if upper Turonien is condensed well, lower Coniacien gets closer to the normal and the average Coniacien is dilated (Grainval).